“The Hunger Games”, directed by Gary Ross; written by Ross, Susan Collins and Billy Ray, from the novel by Susan Collins, starring Jennifer Lawrence, Donald Sutherland, Stanley Tucci, and Elizabeth Banks. Director Gary Ross’s film adaptation of “The Hunger Games,” from Susan Collins’ eponymous novel, has a lot going for it. For one thing, it features a heroine, Katniss Everdeen, played by Jennifer Lawrence, who wowed critics in her breakout role in the indie film “Winter’s Bone.” She is in virtually every scene, so she carries the movie. Katniss is an independent thinker, a provider, a survivor, and a loner who doesn’t care if she’s liked. “The Hunger Games” forces one to think about the future, of a government that not only spies on its citizens, but deprives them of decent living conditions and starves them to death as punishment for fomenting rebellion. But pure repression is not always effective in staving off revolt. Accordingly, the film dissects the methodology of regimes (perhaps our own?) that recognize the value of mindless entertainment and games as a means to tranquilize the population. In the film’s fictional land of Panem, the head of government confides to one of his underlings that the rulers’ aim is to give people hope—but not too much hope. The citizens of the 12 Districts that make up Panem are depicted as dirt poor and living in ramshackle homes. In worn, handmade clothes they look like subjects in a Dorothea Lange collection. They are constantly watched by hidden cameras. In an exposition flashback, we see Peeta Mellark (Josh Hutcherson), who works in his mom’s bakery, throwing burned buns to scraggly pigs in a pen. He sees a starving Katniss, whose father was killed in a mine explosion, lying in the dirt and does nothing. Cinematographer Tom Stern uses a palette of grays and blues in scenes that take place in District 12 villages. The bright green forest under a blue sky provides relief; here, the only place where one feels free, Katniss displays her hunting skills with bow and arrow, egged on by her friend, gregarious Gale Hawthorne, played by Liam Hemsworth. Together they witness a monstrous space vehicle hovering into view, shaking trees and making the earth tremble as it transports the TV reality show “Hunger Games’” organizers to the District. The games, which began almost three quarters of a century earlier as punishment for a failed citizens’ rebellion against the totalitarian Capitol, became so popular they turned them into a reality show that people were required to watch as contestants fought to the death. In front of a crowd of citizens, guarded by white clad, heavily armored (as in “Star Wars”) “Peacekeepers,” Katniss’s sister, Primrose, along with Peeta, are selected by a lottery to be District 12 tributes. In a stunning move, Katniss volunteers in her sister’s place. Katniss and Peeta are treated like royalty aboard a richly appointed hi-speed train that whisks them to Panem’s Capitol. They are ensconced in luxurious quarters; groomed, trained, and fattened up. Lavishly dressed, they must toady to wealthy people in order to convince them to become sponsors. A scene depicts Katniss’s independence and unwillingness to play by the rules: She is brought before a jury headed by a mesmerizing Seneca Crane (Wes Bentley). The jury is too busy gossiping as Tributes demonstrate their skills. But Katniss gets their attention in a startling William Tell move on Crane. President Snow gives the Tributes an avuncular pep talk, then sends them off in individual capsules, uploaded to a dense forest. Once there, the countdown begins, then the slaughter. We are not spared the sight of hacked bodies and blood. White-clad monitors track and manipulate them on computers built into a Lucite table in a blindingly white war room. They can add deadly obstacles or send supplies and medication to their favorites. As in the CBS TV reality show, “Survivor,” the Tributes betray each other and form secret alliances—but virtually all of them lose their lives in the end. Is this merely science fiction? We note that on May 1, New York City cops employed a flying-saucer-type contraption to hover above the May Day Occupy-labor demonstration and spy on the protesters. In this day of FBI entrapments, indefinite detention, round-ups of immigrants and Muslims, and the militarization of police forces, how long will it take for governments to devise a means of punishing citizens in a way not far removed from a reality show called “The Hunger Games”? 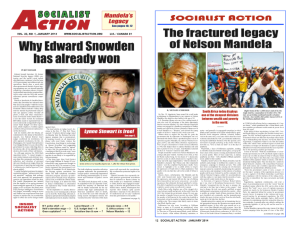 > The article above was written by Gaetana Caldwell-Smith and Michael Schreiber, and it first appeared in the May 2012 print edition of Socialist Action newspaper. May 10, 2012 in Arts & Culture. ← What is a General Strike?